In the early 1990s, North Vietnamese stamps became available to stamp collectors in theUnited States. The Scott Publishing Co. provided listings in its catalog, along with valuations and illustrations. Material from Vietnam and Europe rapidly inundated the U.S. market. Even the scarcest stamps became easy to obtain. Collecting North Korean stamps is far more challenging. Not as much is known about North Korean stamps. The major overseas catalogs do not agree in their listings, and few dealers enjoy a comprehensive inventory. Although the 1946-52 stamp issues endured the Korean War, many stamps were destroyed and data is incomplete. Quantities issued are listed in the German-language Michel Middle and East Asia catalog (Mittel und Ostasien, Vol. 9 in the multivolume world catalog). More important are the quantities of surviving stamps, and perhaps the best way to ascertain this is to know what stamps are in dealer and collector hands. However, this is difficult for North Korean stamps, because comprehensive collections are few and far between. 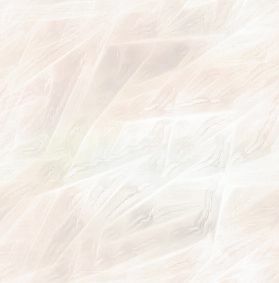 Sources of supply are made known as collectors and dealers become aware of them and publicize them. In time, North Korean material will hit the marketplace in greater quantities as sellers realize that their holdings have value. Many Korean War veterans brought stamps from looted post office stocks into the United States after the war. No doubt some of these stamps found their way into collectors’ hands. Most early issues are plagued by official reprints. The reprints were produced by the government in 1957 to satisfy collector demand. Reprint designs usually are blurry or sharp, and sometimes they are a different size than the originals. Generally, reprints sell for $2 each, while most original stamps are more expensive. As a collector, I would want an example of both the original and reprint, as both were officially produced. I separate North Korea into three groups. The classic era of crudely designed stamps, 1946-54, provides many of the elusive issues that will prove so challenging and enjoyable. The first issue of 1946 consists of five designs with denominations of 20 chon and 50ch.. The 50ch rose-red and 50ch violet stamps appeared perforated 11, perforated 11 horizontally, perforated 11 vertically, perforated 10 and imperforate. Many shades exist. These stamps, like all early North Korean issues, were produced without gum. In August 1946, North Korea honored the first anniversary of its liberation from Japan with at least one stamp. I say "at least one" because there is disagreement among specialists regarding how many stamps were issued to honor the liberation. The imperforate 50ch brown Kim Il Sung stamp, shown above (left), is one of North Korea's scarcest issues. Mint singles regularly sell for $300 or more. Both the Michel Middle and East Asia catalog and North Korea’s own official 1946-98 Korean Stamp Catalogue also list and picture a 50ch red stamp with an unidentified portrait, shown above (right). The Stanley Gibbons Japan and Korea catalog (Part 18 of the Stanley Gibbons Stamp Catalogue) does not. I’ve never seen nor known of an example of the 50ch red stamp. It may well be unissued or a fantasy. Three Flag stamps issued-1948-49, are among the most affordable of the early issues. The 6-won Flag stamp is known with shifted red and blue colors. Severe color shifts are fun to collect. In 1950, North Korea invaded South Korea and briefly captured its capital, Seoul. The 1w Liberation of Seoul stamp of 1950, showing a red, blue and turquoise flag flying over a building, shown above, is an evocative issue. It is a beautiful stamp that is in high demand. Any of these stamps on cover provides an added dimension to a collection of North Korea. 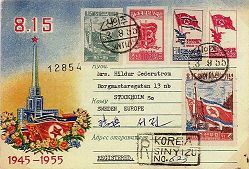 Shown in Figure 3 is a 20w Soviet Union Friendship Month stamped envelope with a colorful cachet recognizing the 10th anniversary of North Korea’s liberation from Japan. The envelope was sent registered from Sinyizu Sept. 3, 1955, to Stockholm, Sweden. A total of four stamps (from left to right) adorn the cover: a l0w dull green Liberation from Japan stamp, a l0w Soviet Union Friendship Month stamp, a 20w Soviet Union Friendship Month stamp, and a l0w pale red, blue and chestnut Liberation from Japan stamp. The cover is displayed on the cover of Carmichael and Todd's North Korea Postal Stationary 1947-1961 Catalogue. In contrast to such colorful examples as the cover above, military mail was sent without stamps. The period of 1955-73 is one of transition for North Korean stamps. Designs can be highly patriotic. Many closely resemble the stamps of China (People’s Republic) from the same era. The 1955-73 issues are better designed. While the earlier stamps resemble crude wood block prints, these are more delicate. The four stamps of the 1961 Enhancement of the People's Living Standard set, shown below, are representative of this period. The four stamps depict live­stock breeding (upper left), the fishing industry (upper right), agriculture (lower left) and the textile industry (lower right). The images are taken from the 1998 Korean Stamp Catalogue. Stamps from 1974 to date are highly colorful and topically oriented. We see considerable use of the English language on tabs (selvage with printed text or images) that describe many stamps. Because North Korea wanted hard currencies from over­seas collectors, topics far afield from Korean culture--such as Joan of Arc and renaissance artist Rubens--highlight many sets from 1974 onward. A 1979 three-stamp set, for example, recognizes airships. Two of the stamps are depicted below. The l0ch stamp on the left shows the airship Fleurus, and the 20ch stamp on the right shows the Nl airship Norge. 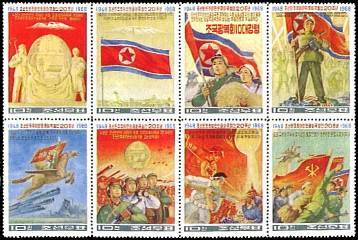 Some North Korean stamps have politically sensitive themes related to the United States. Some stamps portray the U.S. embargo against North Korea that has been in effect since June 25, 1950. 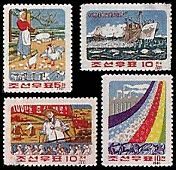 Some issues are most provocative, such as the eight stamps released in 1968 to commemorate the 20th anniversary of the founding of the Democratic People’s Republic of Korea (North Korea). The l0ch se-tenant stamps are illustrated below. I used information from three previously mentioned catalogs in writing this column. I prefer the Stanley Gibbons catalog because it’s in English. The Michel catalog is more comprehensive but is in German. The Korean stamp catalog, published in Pyongyang, North Korea, is in English, but it is hard to locate. The Korean Stamp Society is the logical place for more information.